This well established venue is playing an increasingly important role during festivals (eg.Manchester / Irish festival and Young Gifted & Green). "The biggest capacity independent venue in Manchester....." complete with big rig and video screen. 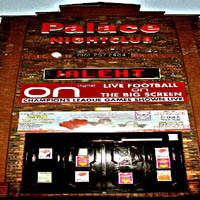 Whilst just on the edge of the City Centre, the venue actively supports the manchester music scene and helps up and coming bands . This venue is reputed to have turned away a fledgling Oasis due to them not being good enough - sounds good - Check their site for gigs and for this years Irish Festival, BBC Live events, In The City and their new 24hour Rockfests. You won't believe it until you see it. sound:great with right engineer ::: layout:big big big ! great stage ::: lights: pretty awesome + video playback::: beer:draught good prices + guiness !